The temps in Virginia are finally descending. Took all of October, but I feel like my favorite season has finally begun. And this mystery image - I know nothing about it, do you? - is a depiction of my desired state. Cozy, warm, colorful, rich...all the things I love about this season. Halloween costumes make their debut this weekend and my kids could not be more excited...fingers crossed the costumes stay intact through Tuesday. Hope you have a fun weekend ahead. See you next week! 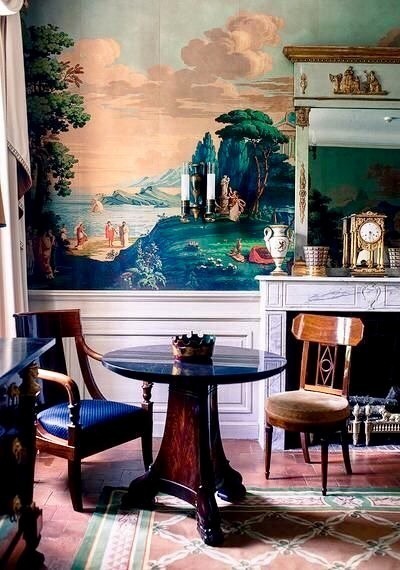 Wallpaper as landscape -- a brilliant and inviting solution. Bonus: the three-dimensionality of the landscape adds more depth to the room. A winner. Thanks for posting, and happy Halloween!